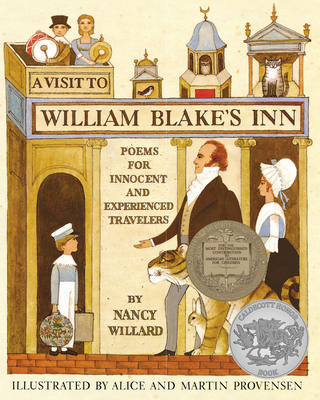 Nancy Willard has loved William Blake’s poetry from the day she first heard it. While writing the poems in this book, she built a six-foot model of the inn, decorating it with moons, suns, stars, and prints of Blake’s paintings. The model with its residents—the characters that appear in this volume—stands in her living room. Nancy Willard published her first book when a high school senior—an inset in the Horn Book, which was called A Child’s Star. Formerly a lecturer in the English department at Vassar College, she is the author of a number of well-received children’s books, including Sailing to Cythera: And Other Anatole Stories and The Island of the Grass King: The Further Adventures of Anatole, both winners of a Lewis Carroll Shelf Award. Alice and Martin Provensen have been honored by the Art Books for Children Citation of the Brooklyn Museum, by the Gold Medal for illustration of the Society of Illustrators, by exhibitions at the American Institute of Graphic Arts, and by being included on the New York Times Best Illustrated Children’s Books of the Year list on nine occasions.